Today was a day of extremes, but more on that in a moment. The week was disastrous for SILVER and GOLD PRICES, encouraging for stocks, and triumphant for the scrofulous US dollar index. But let us see if perchance we might find a flotsam bit of truth bobbing on the sea of illusion. The GOLD PRICE sank 1.5% or $16.80 to $1,087.60. The SILVER PRICE plunged 2% or 29.2 cents to $14.696. 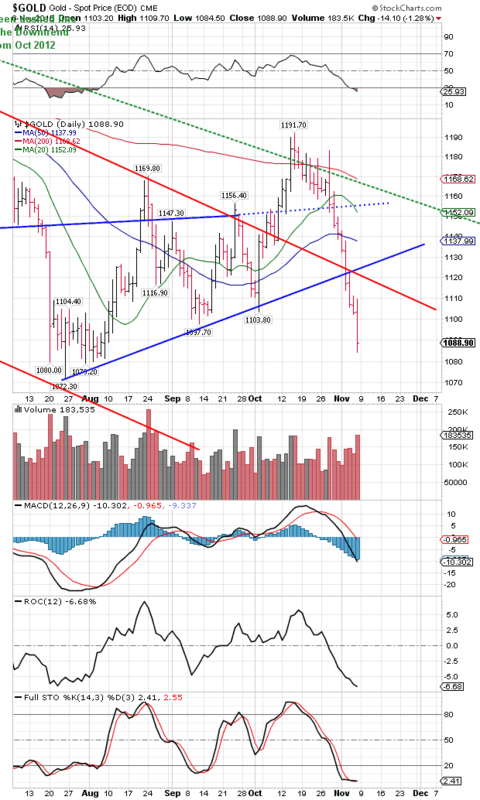 The gold price has now fallen nine days running, breaking the uptrend line from the July low and stopping today a meager $15.30 from that $1,072.30 intraday low. If it ain’t an extreme and a double bottom, then bite your tongue, it’s signaling an even bigger drop. And this plunging must stop soon. Very soon. Silver’s not quite the same. It did break the uptrend line from the August low, but that depends on how you draw that line. Draw it through the October low, and it only today pierced the uptrend. Not good, but better’n being dropped naked into boiling nitric acid. What does it all mean? Here’s the best I can figure. The Fed has engineered an unreal world, quintupling the money supply since 2008 and steering all that inflation into the financial asset markets by zero interest rates. How far can they go? Will they begin buying stocks outright to prop up the market, as the Bank of Japan is now pondering? How long can a lie stand? I mean the lie of the stock market, with its rise based not on economic forces but only on inflation. At some point, some catalyst will drop a hammer on the glass doll’s house, and break everyone inside. Whether that happens Monday or a month or two months from now, I don’t know, but happen it will, and soon. A bottom in silver and gold will also happen soon, if the summer lows don’t hold. Listen to my words, write this down: when the hammer drops, you’d better be out of stocks and holding plenty of silver and gold. ‘Twas a day of extremes. Silver and gold prices, platinum reached extreme lows for the move (palladium did yesterday) while the US dollar index reached an extreme high. Indeed, sometimes extremes signify continuations coming, but sometimes tops and bottoms. Today the lying jobs report blew all before it. I am too intellectually fastidious, embarrassed really, to remind y’all that within a fortnight the same lying government jobs report will be revised, and probably by a chunk that makes today’s enthusiasm seem laughable. It happens every month, and every month markets fall for it. Why? They want to believe a lie. It comforts them. If you take this month’s jobs report and average it with the last two months sorry jobs reports, you get a number that barely indicates a living economic body. Yet although it’s all a con job, markets reacted as if the FOMC had already announced an interest rate rise. That shot jet fuel into the dollar and the 10 year treasury yield, and sucked the gas out of stocks’ tank. Yet ’twas all on anticipation, and no facts. US dollar index rose 121 basis points to 99.26, besting the last 98.43 high and approaching the March intraday high at 100.71. Breaking out through the trendline as it has, it is signaling a rise to 104.56 — but maybe not right away. Today’s extreme looks like the end of the upmove from October. The jobs news was a perfect accompaniment/catalyst for one last surge. Time for a correction. Dollar’s surge broke the euro’s back. It fell 1.27% to $1.0743, a crushing break of support reaching back to May. Bye-bye, euro! Bye-bye yen, too! Yen lost 1.16% to 81.19, busting support from August. 10 year treasury yield today hit its downtrend line from 2007. Markets are taking up rates with or without the Fed, but certainly in anticipation of the Fed. 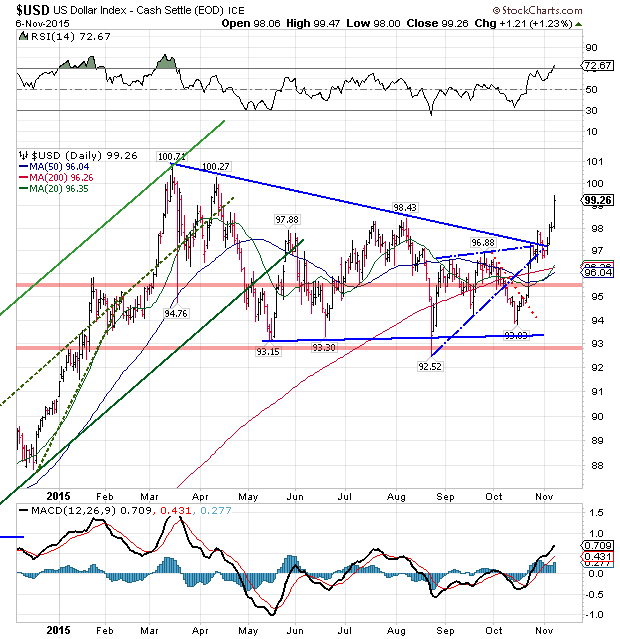 That puts the 10 year note (price move opposite to yield) near a breakdown. That won’t do at all, Nice Government Men! Stocks did not like the jobs report with its inference that lower unemployment would alibi the Fed’s raising interest rates. They fell off a cliff until about 10:30 when, miraculously, somebody began buying and drove them back up, well, a little. (If y’all don’t get irony, you’d better change channels now.) Confusion still reigned, with the Dow up 46.9 (0.26%) to 17,910.33 and the S&P500 down 0.73 (0.03%) to 2,099.20. ‘Twas also a day of extremes for the Dow in Gold and Dow in Silver. Dow in gold has closed today at 16.45 troy ounces, and has retraced almost all the ground from the July high at 16.50. 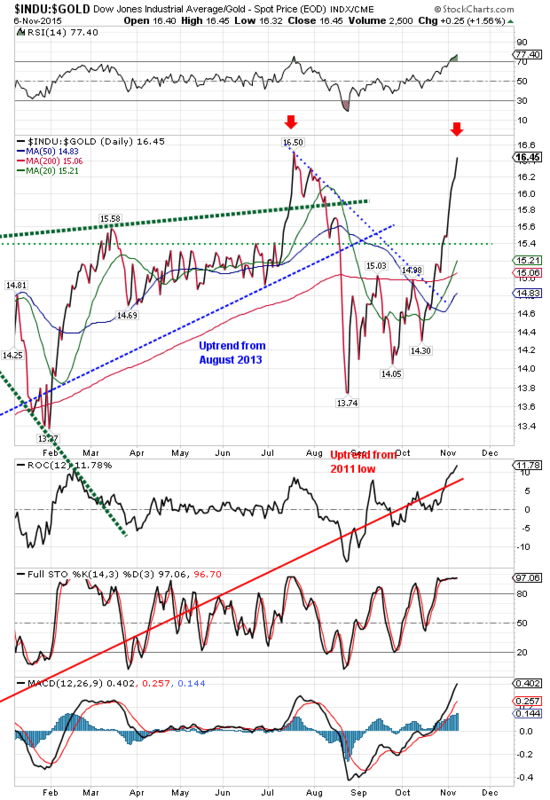 RSI is also critically, repletely overbought. Can this be signaling the limit of the rebound? If so, ‘twould leave a clean double top on the chart. If not, we’ll be swimming in this sewery slough for a lot longer. Dow in Silver offers a like picture. Today’s 1,215.08 ounce high nearly reached July’s 1,236.37 ounces. Also strongly overbought. It’s been a long day. I’m fixing to go enjoy supper with my wife. I try my best to keep my priorities straight, and she’s next to highest on my list.